Lake Forest, Ill. - Lake Forest College women’s hockey player Courtney DeHoey (Chatham, Ont./Bluewater Jr. Hawks) was named Northern Collegiate Hockey Association Player of the Week on Monday (November 13) for her performance the previous weekend (November 10-11) as Lake Forest swept the University of St. Thomas, the nation’s 10th-ranked team, at home. DeHoey, a junior forward, scored two of the Foresters’ goals and assisted on the other two in Friday night’s 4-2 triumph. Both scores came on the power play and occurred when the game was tied. Her second goal turned out to be the official game winner. DeHoey also gave the Foresters the early lead on Saturday with the first goal of the contest. She later assisted on another score that put Lake Forest ahead 3-1 midway through the second period. 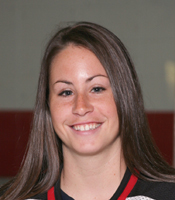 DeHoey leads the 2006-07 Foresters with six assists in four games and is tied for the team lead with nine points. She led the squad last year with 16 goals and a school record 30 points. NCHA Players of the Week are selected by the league’s sports information director. DeHoey also earned the award twice last season.